It’s the big hole in the ground that has Brisbane locals and visitors talking … and in 2018, the excavation site for Queen’s Wharf Brisbane hit several major milestones. In November contractor Probuild hit the halfway mark after removing more than 250,000m3 of material from what is Queensland’s biggest basement excavation. However, the first major milestone of the year came in February with the recovery of 134-year-old electrical cables, known as ‘Edison tubes’, from William Street. The Edison tubes were installed in 1884 and used to run power from the Government Printery Building to Parliament House on Alice Street. The discovery of the tubes attracted global attention for their historical significance and samples of the recovered tubes have been shipped to museums around the world for public display. Also earlier in the year, workers recovered heritage kerbstones that provided important evidence of Brisbane’s early development and construction. Approximately 80 metres of heritage kerbing along William Street, that were laid after the street was widened in 1938, were removed and preserved for future re-use in the Queen’s Wharf Brisbane development. Some of the early 2018 work included completing more than 170 piles between March and May. These piles form part of the support structure for the Integrated Resort Development basement carpark. A 172-metre-long diaphragm wall, designed to prevent groundwater from entering the site, was completed in mid-September. In 2018 excavation work progressed well and as at December, was at a depth of 20 metres below George Street. 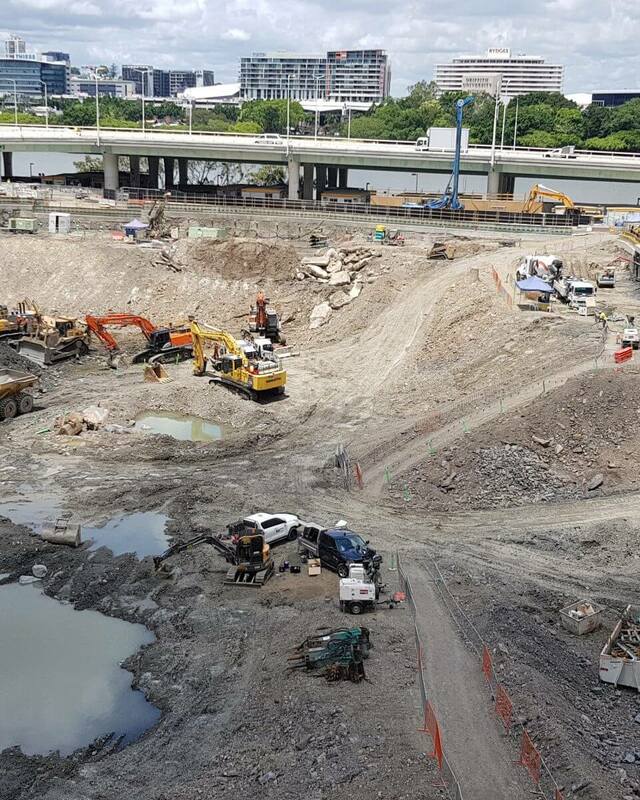 The excavation is the biggest to occur in Brisbane, and when finished it will create a five-storey basement with carparking beneath Queen’s Wharf. Excavation of the basement carpark is expected to reach completion in August 2019. The carpark basement will service the entertainment, dining and tourism development when it is due to open in late-2022. The next phase of works in 2019 will see tunnelling operations commence on a new trunk sewer to connect Queen’s Wharf to existing sewer infrastructure on North Quay near Turbot Street. The sewer connection will be built using a tunnel boring machine. During the tunnelling, a temporary lane closure will be in place for the right-hand lane off North Quay between Turbot and Anne Streets. Traffic signage and information about the start of these works will be communicated in the new year. As always, for more information about the project, visit our website www.queenswharfbrisbane.com.au or visit our Facebook page www.facebook.com/queenswharfbrisbane. The Probuild team will return to work on Monday 7 January 2019. Until then, we wish everyone a safe and happy holiday period.